Looking for a strategy for setting and combining parabolic indicators for scalping trading or long-term trading. You have visited the right page. How to read the parabolic sar indicator accurately. In 1978 In his book "New Concepts in Technical Trading", J Welles Wilder introduced Parabolic SAR (usually abbreviated as just using SAR). Together with RSI as one of the main indicators in trading. The SAR itself is short for Stop And Reverse which is more or less interpreted as an indicator of the Stop Loss point in trading. In its development in the future, Parabolic SAR is one of the effective indicators in determining the trendy market conditions (trending market) along with facilities called Trailing Distance which are widely provided on various forex trading platforms. Parabolic SAR uses exactly the same as the Moving Average or other trend indicators. It's just that Wilder created this indicator to eliminate the shortage of MA, which is the nature of the curve that often results in miss interpretations. With SAR in the form of points, up or down trends become more certain and no longer cause misinterpretation. On SAR, when the price is in an uptrend, the SAR point is below the price movement. Well, we are included in the discussion about the use of SAR that is quite unique here. Even only SAR that has the ability like this is the use of SAR as a determinant of the Stop Loss point.Remember that SAR is short for Stop and Reverse which means more or less stop and then reverse direction.SAR points not only can be used as a determinant of up trend or down trend.Likewise the distance between the SAR point with the lowest or highest price of the existing bar can not only be used as a strong determinant of the weak trend that occurs (see picture above)More than that, if you are a trader with Stop Loss (it is highly recommended to trade using Stop), then the good news is that SAR points can be used because of your Stop Loss point.Some beginner traders mostly hate this one facility, Stop Loss.The reason is because if they install Stop Loss, often their position touches the Stop point which means they are a loss.Finally, they prefer to let prices interact casually while waiting for "night to end" and "morning to shine" aka the price reverses direction so that their negative position changes positively.The bad news for those of you who trade in this way is that there will come a time when maybe the night will never end and the morning will not come aka the margin call occurs.This is not just one or two times I see, but most of those who trade without stop loss always end up in the same gap.Remember bro ... Stop Loss is not to make you lose. He is there to limit your losses and distance yourself from a nightmare called margin call.Of course you do not want to trade not only one or two times and then break down just because of one wrong position. There is no one trader who is never wrong in determining a position.Even the master trader often falls due to a position error. It doesn't matter how many times you are wrong in determining the important position is that in aggregate you still profit!Now let's go back to the discussion of our SAR and Stop Loss. It's gone far too far ...Pay attention to the picture below:Now the picture above shows that when the SAR point moves from above to the bottom, then it is an indication that the downtrend has been completed and resumed with an uptrend.Under these conditions, it's time to take action. But as we understand together, however, we cannot ensure 100% that prices will continue to rise.Thus we need to use the Stop Loss (SL) limit in opening a position. The lowest SAR point we can use as a benchmark.You can also use this SAR facility by combining it with the trailing distance facility on the platform. Unlike Stop Loss which is static and cannot shift automatically, trailing is a Stop Loss that is dynamic or can move following price movements. 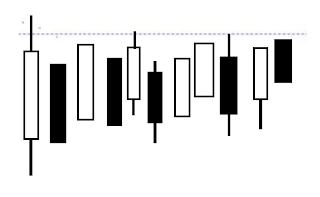 We have studied various aspects of this indicator. SAR is very effective to be used in various trending market conditions. But there are times when SAR becomes ineffective and cannot be used as a main indicator. 0 Response to "How to Use Parabolic SAR Indicators for Scalping Combination Setting Strategies"